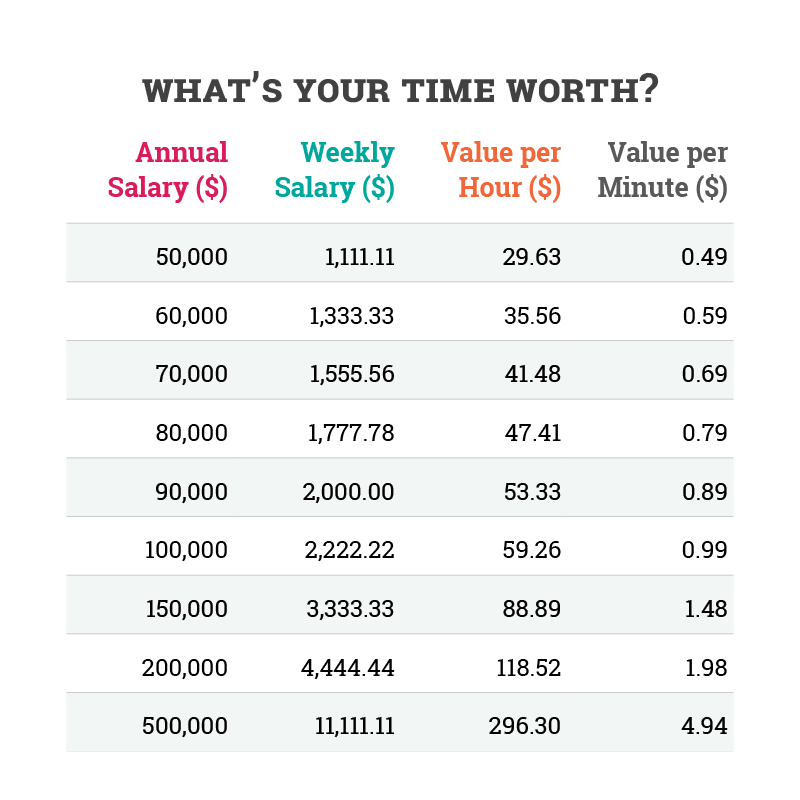 Have you ever worked out your hourly rate, or the value of your time in 10 minute increments? Do you know what your time is actually worth so that you can prioritise your activities by yield and PAY yourself accordingly? Let’s say your salary was $100, 000 per year, you take 6 weeks paid leave and 1 week of public holidays are accrued annually, you work 37.5 hours a week [1725 hours of work per year]. Your value per hour is $59.26 and every minute of your time is worth $0.99. OK, so you’re not quite Bill Gates earning roughly $114.16 per second, but 10 minutes of your time is still valuable; it's worth around $10.00. As you start to think of your time in 10 minute intervals, the value you place on activities changes. Someone comes into your office for a chat. 10 minutes passes; you are effectively handing them $10. 20 minutes late to a meeting, the cost to everyone involved is proportionate. When you value your time, you value your focus. Effectively prioritising your tasks enables you to realise what is important and what is not. Not every task is important and not every task is urgent. Knowing the value of your tasks and their importance in helping you to reach your goals will help you to allocate more time to those tasks within your Daily Focus planner. Steven R. Covey in his book ‘The Seven Habits of Highly Effective People’ suggests using a 4 quadrant matrix to help you realise just how important and urgent your tasks actually are. He suggests that you classify what you do according to their level of importance in helping you to realise your goals. He refers to this quadrant as the quadrant of necessity. Here you find tasks that are important in achieving your goal, and they have an impending deadline which makes them urgent. These tasks must be finished and require your immediate attention and focus. These become your number one PAY activities and are scheduled in your Daily Focus planner. Quadrant 2 should be your focus. Covey calls this the quadrant of quality and personal leadership. How you plan for and execute tasks in this quadrant is visible to those around you. Whilst tasks in this quadrant are important, they can always be planned for. Focus given to these tasks increases your effectiveness. Schedule them in your Monthly, Weekly and Daily Focus planner. These tasks definitely increase your yield. The quadrant of deception, these tasks usually offer little value to your goals. Try and avoid these tasks as much as possible. Spend time focusing on what is important. Learn to say ‘No’ or to delegate them wherever possible. PAY someone else; they are stealing time and focus. You don't want to see them on your planner! These are your low priority tasks that give you the illusion of being busy, Covey calls this the quadrant of deception. The tasks have little significance in your life and often take up a signification proportion of your time on a daily basis. Keep postponing these tasks forever and you will notice a significant increase in your productivity, never PAY these in your planner. Planning and goals are important if your dreams are to become your reality. Goals quickly become redundant if your daily activities do not revolve around the tasks that help you achieve them. Everything on your Daily Focus planner should be aligned with your goals. If you want to run a marathon, then your Daily Focus planner will be filled with running commitments. If you want to be an awesome manager, then your Daily Focus planner will be filled with one-on-one meetings with your team members. If you need help with your time management and business planning skills then checkout our Business Planning Toolkit designed for those who don't want a life of imitation. It's a downloadable, printable, reusable suite of awesome resources - Business Development Tools, Project Planning Tools, Time Management and Concept Development Tools - all guaranteed to get you business focused! Plan Differently. Think Differently. Focus! If you found value in this article hit the 💙 button below, then share it with someone you know who would benefit from reading it. Business Planning...Freedom Starts between the ears!